Disclaimer: This is written from a 2D artist / illustrators point of view with procrastination issues. I had been procrastinating about learning 3D art for years. I kept telling myself it would be too difficult, it was expensive and that my computer wouldn’t be able to handle it. I tried a free trial of ZBrush many years ago but it was too much for my computer at the time and the price tag was huge. Years ago I had also downloaded Blender out of curiosity, opened it, took one look at the interface and closed it again. Blender is a free open source software program for 3D modelling, sculpting, UV mapping, painting, VFX, and animation. Disclaimer: This article mentions a lot of free and paid software for 3D art and I’ve included links. I am not being asked, paid or sponsored to write this article. Warning there is some personal introspection, but I’ve tried keeping it to minimum. My website is thimblefolio.com if you would like to look at my art and illustration. Fast forward a few years to 2014 and I was busy doing a foundation art and design diploma course. My confidence in pretty much everything had been shot down due to a series of unfortunate events, and the course really helped to kick-start me in a better direction. I did very well and ended up getting a distinction grade. They had told me I should consider doing an MA in children’s Illustration, but I wasn’t sure what I wanted to do and I couldn’t afford it anyway with already having a degree, student loan debt and having next to no money. The parting words of advice from my tutor were that my art looked flat and I should try 3D. She wasn’t quite that blunt about it, but that’s what I took away from it at the time. I’m not sure whether she meant real sculpture or digital art but I took her advice seriously. After my course finished I started to brainstorm creative ideas in my sketchbooks and learn more about illustration and concept art. I also started to learn vector art. Vector art was another thing I had told myself would be too difficult or technical for me to learn, but I had been job hunting and all the jobs I looked at said they wanted someone with vector art skills so I decided to make an effort. (This is related to this article, just bear with me). After working on many sketchbooks, doing a few online courses from SVS Learn, obsessively listening to the Seanwes podcast, learning vector art and about concept art I decided I should go back to the art fundamentals. To cut a long story short, I realised that lighting and perspective were the key to solving the puzzle of what my tutor had suggested, and I understood I was lacking in confidence in that area after trying to help my sister with Nnewts 2 (a graphic novel I helped with). I found a website called Sketchfab where you can view 3D models. I considered this as a useful resource for drawing things from different angles at the time, I didn’t think about making 3D models myself until later, I kept telling myself it wouldn’t be worth the time and that I should just stick to 2D art. I did dabble a little with Wings 3D in 2016 and I found MagicaVoxel. I tried SketchUp but I didn’t like it as much as Wings 3D. I looked into whether I should try 3D Coat. I spent a lot of time from 2016 onward in an “exploratory phase”. The more things I learned and the more I opened my mind, I understood the only thing that had been holding me back was my own fear of the unknown. I spent time going through the Scott Robertson books on perspective drawing from 2016 and got to a section where he discussed 3D software for the purpose of guides for concept art. Basically the world kept telling me I should learn 3D despite my reluctance to do so, or maybe I just needed to hear it more than 7 times first. After I accepted that learning 3D software would be a good thing to do I bought the amateur license for 3D Coat and researched more about Blender despite being really unsure of it. It looked so complicated. I kept trying to find what I thought were “easier solutions” for a long time. My experience with 3D Coat was not too successful. I didn’t understand what to do with it having no knowledge of 3D at all and was having problems with my computer crashing a lot. This made me go back to doing more traditional drawing with pencils and paper for a time. I had also joined the Seanwes community from 2015 to 2016 and toward the end of 2016 talked to a concept artist that had worked on Halo about things (Eric Lin). He told me they used 3D software to block out perspective in a scene and then they painted over it. It was pretty mind blowing to me at the time, but it seeded the idea that I should really make an effort to learn 3D software as well as working on core art skills. Despite my reluctance at trying Blender from thinking it was too complicated for me, I kept reading how amazing it was and seeing fantastic art people had made with it. I bought some beginner courses on Udemy for it at the start of 2017 while they were on sale for around £10 each. I downloaded Blender onto my old laptop with portable apps. I watched the tutorials and did a few of the exercises. I found it very technical and dry to learn at first, but I did learn the basics of the 3D navigation in Blender and how to control the camera and the lighting. I think just those things alone are pretty useful for a beginner to 3D software. From my 2D artist point of view I could test lighting scenarios and camera angles with free imported 3D models just with that basic knowledge. Perhaps I’ll write another article on where you can find free 3D models in the future. 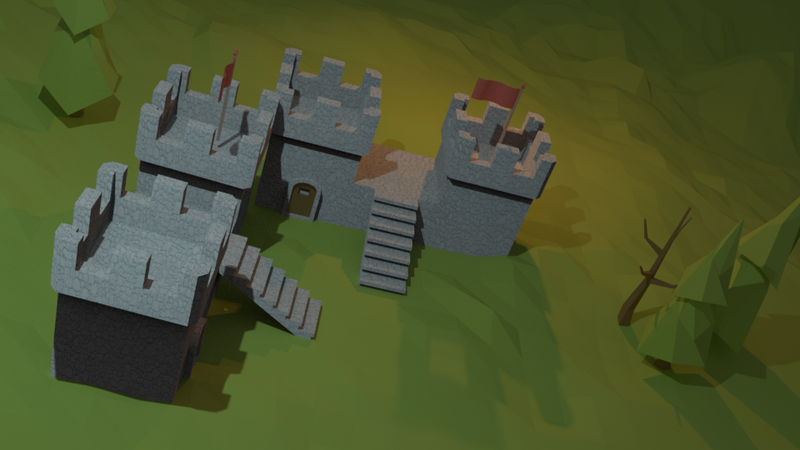 I also found a software called Asset Forge which I played with a little in my exploration of 3D. An imported model I made in Asset Forge and then rendered in Blender I made in 2017. Throughout 2017 I mainly stuck with learning foundational skills in 2D art, perspective and lighting in particular. In June of 2018 I looked into doing the 3D stuff again after becoming frustrated with perspective drawing. Just to make it clear, I am fine with understanding basic perspective and I found Scott Robertson’s books fascinating. I made a blog about this here: https://thimblefolio.com/comic/development-log-for-june/. I had really improved my drawing skills over the years, but I could see the advantages in doing 3D block outs for base perspective guides, different viewpoint reference and lighting reference more and more. I had bought an old used copy of a book called “Perspective for Interior Designers” and it had a method called the “revolved plan method” for working out viewpoints in perspective from a floor-plan drawing. After trying this a few times I gave in. I resolved that learning how to do it using 3D software might be better after all. I wrote another blog post on the subject of getting into 3D art here on Medium in July. After some exploratory experiments using a software called Room Arranger and another one called Smoothie 3D I decided learning basic 3D modelling skills would be useful to my workflow rather than just relying on free models, so that I could customize things more. Some 3D room angles I made using Room Arranger software. I wanted to be able to make simple models and perhaps paint them as well to help with illustrations and concept art. I think it was the gradual de-mystification of combining the use of basic functions in Blender (controlling camera angles and lighting) with using imported models made in simpler software (Smoothie 3D) first that helped my decision to commit to learning Blender in more depth. It was around October last year (2018) that I decided to commit to learning modelling skills in Blender properly. I wrote about it in a short blog post on my website. Basically I got so frustrated with myself for putting it off I bought a beginner crash course on it from CG Cookie and haven’t looked back since. Oh and the reference to vector art and why it was relevant to this article, I almost forgot… that was another thing I had put off for years and years and then when I tried it using Affinity Designer from 2016 onward I loved it. I just wish I had tried these things earlier instead of being hesitant, although in the case of learning vector art I guess I could write another article on that at some point if I’m bored. 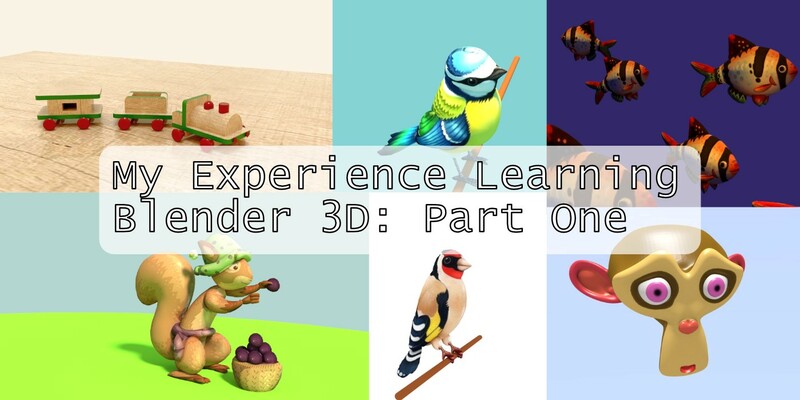 I apologize for this being a bit of a long ramble, there may be a part two in due course, but in the mean time to anyone who may be thinking about learning 3D software but keeps putting it off like I did, just try it. You won’t know if something is for you or not until you try it for yourself. It irks me when I see other 2D artists like me asking online if they should learn 3D art or not and being actively discouraged by others. Just do it!